To Nick, fitness had always been a matter of life and death. He played sports like most normal kids, but lost interest with it by the 7th grade. When he was in 8th grade a life world changing event happened that changed his life’s focus, the World Trade Center Towers were attacked on 9-11-2001. From that moment on he knew his purpose in life was to help people by protecting his family, friends, and country. From that moment on fitness became about being able perform his duty as a soldier to protect his country. He promptly joined the military when he turned 17 in his junior year of high school. During his time in the military kept his focus on being the fittest soldier he could.He eventually gained the notice of his commander who recruited him to improve the physical fitness for his unit. From this point on he was the unit’s personal trainer, group fitness trainer, and fitness test administrator. After completing his 8 years and 2 combat tours in the military Nick realized that his focus for helping people was stronger than ever. He sought to bring his passion for helping people to his family, friends, and community by pursuing a degree in Exercise Science. During his time working to obtain his degree in Exercise Science he held positions as a Crossfit coach, personal trainer at several different facilities, self employed personal trainer, and online health and fitness coach. 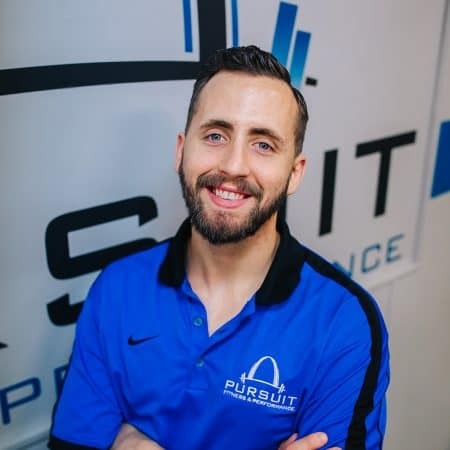 During his schooling at Lindenwood University he learned about Pursuit Fitness and Performance from a professor who thought he would love it, and love it Nick did. He especially loved it because it is a place where the staff genuinely cares about the members and works to improve their health, fitness, and quality of life. The atmosphere of the facility and its members was like that of a family, and Nick wanted to be a part of that as well. He looks forward to fulfilling his passion for helping people at Pursuit Fitness and Performance.